Although there was some automated backup at the free shared hosting account, that is of little comfort when you've made several changes to a website in one day and realize (too late) that you've lost some important work. Developers are quite used to some sort of version control system always having their back and this situation is no different. Join a community of like-minded developers who want to help Canadian non-profits. When I first started volunteering with the Orléans Festival, we were lucky enough to have free web hosting by a local company. There was "unlimited" disk space and bandwidth on a shared Linux box. As I discovered while registering us for Office 365, there are only so many DNS records you can manipulate through cPanel. Since some records require going through the DNS hosting website and our provider held our registration along with his other customers, there was a bit of a bottleneck and unnecessary layer of red tape. Personally I think every entity should be in control of as much of as its assets as possible. One of my original goals was to get everything tech-related into a "proper" state so that anyone could take over in future years. Controlling your own registration and DNS is definitely part of that. Moving domains with .ca is fairly straightfoward. You need whoever currently registers the domain to unlock it and then provide you with the transfer code. After that, you follow the instructions provided by your new DNS hosting service. Without worrying about storing or retrieving from the database, let's integrate the model classes we created a while ago. You'll notice that we've renamed Name to ItemName; that's because if we want to display sample data in the designer, we'll end up conflicting with the one defined in ReflectionTypeNode. You'll want to update SampleData/MainViewModelSampleData.xaml accordingly. <TextBlock Text="IS IT WORTH IT?" Note: by default, the framework will automatically bind a control based on its name. For example, our LongListSelector having x:Name="Items" means that it will automatically have its ItemsSource set to Items from our ViewModel. However, this doesn't work at design time, so I've left the explicit binding in. The same is true of the TextBlock inside our DataTemplate. You don't have to explicitly bind it to ItemName if you're not worried about the design-time experience. 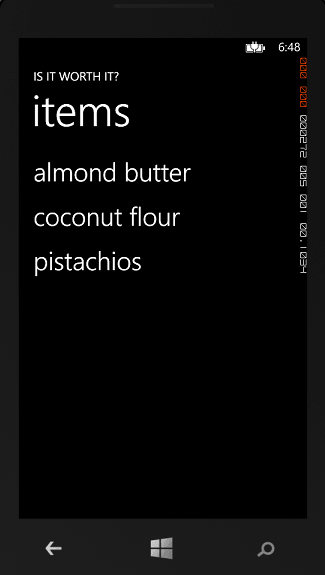 Interested in learning more about developing for Windows Phone 8? Enter your information to receive e-mail notifications on relevant articles. After wasting spending a couple weeks writing the "sprint two" post on data entry (and MVVM, DI, etc), I've realised that I need to focus on audience. Sean d'Souza and The Brain Audit have finally sunk in. When I started this series of posts, I didn't really consider who exactly I was writing for. 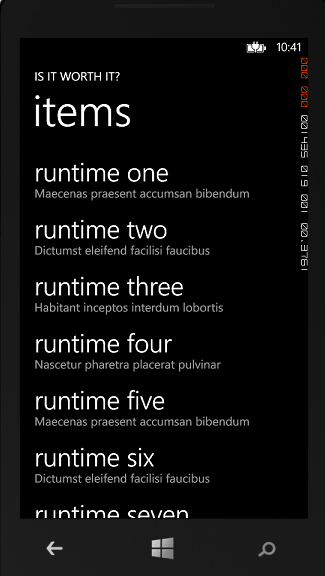 Trying to balance between beginner and intermediate is tough, especially when I'm fairly new to WP8 development. Someone is bound to get bored or lost. These posts are targeted at experienced Windows developers, preferably with some knowledge of WPF and MVVM, who want to write a Windows Phone 8 app. Of course this means the series has officially been renamed to "Journey to the WP8 App Store in 3 months" :) Eep! I'm going to be using Matteo Pagani's series on Caliburn Micro with Windows Phone 8 as a reference (along with SO, of course). In case Matteo's site disappears, I'm copying the code examples here and modifying as required to work with the latest version of Caliburn.Micro. Total credit goes to Matteo. To be honest, this looks an awful lot like configuring Prism. Unity has been replaced with PhoneContainer and there a few phone-specific methods, but the code should be quite recognizable. We declare the bootstrapper inside Application.Resources, and since we're letting the framework configure everything for us, we can strip these files down to a minimum. Views and ViewModels are stored in separate folders, named Views and ViewModels. Note that the sample app already creates ViewModels for you. The namespaces for Views and ViewModels should also end in Views and ViewModels. Delete the line in DetailsPage.OnNavigatedTo that is setting the DataContext. Details will just have to be broken for now. Add a call to LoadData from the MainPageViewModel constructor. We recently had our ensuite bathroom renovated. 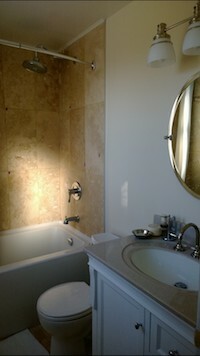 Remodelling a small ensuite is a simple job that should have taken 7 to 10 days. Almost eight weeks later, we're still not able to sign off on the work. We have experienced terrible communication, a complete lack of quality/workmanship, outright mistakes, delays and a large bill that is no longer defendable. And, we went with a reputable company: Home Depot. Yesterday morning we had another 'final' inspection, this time with a Home Depot manager present. I was discouraged to learn that the official company attitude is "we'll keep fixing things until it's right". Sure, there was an 'apology', and a tacit acknowledgement that we might have been inconvenienced, but no actual compensation offered/promised. I felt frustrated. Helpless. Angry. And yet we got none of that. We did the inspections and pointed out mistakes. We answered the tradesmens' questions. We had to prompt/remind them to order materials. We basically acquired all the stress of managing a project. I mentioned my thoughts to Lisa, and wondered out loud if they (the contractors) ever go home at night and feel bad about screwing over their customers. Do they even care? Or do they think that they are really doing the best they can, things happen, and we should still be paying full price regardless of all the problems they caused? And then it dawned on me - as developers, we do this to our clients. At the very least, we did it in the past and have vowed to improve. What happened when you went home from work that evening? Did you empathize with the client? and that you deserve to be paid in full because, in the end, you completed all project deliverables. This bathroom remodelling experience really made me think. As little as I understand about installing a vanity properly and re-connecting pipes, my clients probably understand even less about what I do to deliver their software. And if something doesn't work, they probably feel frustrated and helpless. Of course. We can keep returning to the principles of agile development to provide value on an ongoing basis: smaller iterations, more involved customers, more automated testing for our code/deployments. I smile thinking about how awesome it would have been had these principles been followed during our remodelling job :) By day three, when we realised how many mistakes were being made, we would have had them stop. They would have been paid for their time, and we could have refocused on the best way to finish the job. Thanks for reading about my aha! moment. As someone who's been keen on "agile" and TDD for years, I've never identified as closely with how we are trying to help our clients until now. But most importantly, make sure you are delivering value on an hourly/daily basis to your clients and make sure they agree what you are delivering is of value to them. Update: Many thanks to Lisa who spent an hour on Sunday morning help me re-structure this rant from late Saturday evening.